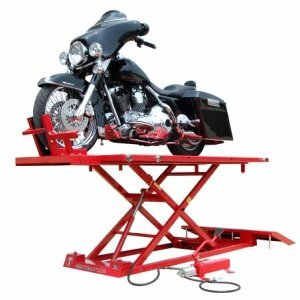 On MotorcycleLiftsForSale.com we cover lift tables, wheel and tire stands, bike stands along with all types of jacks and motorcycle dollies. You will find equipment that is electric, pneumatic and air/hydraulic powered as well as simply lever operated units. We aim to display both professionally manufactured lifts along with custom DIY homemade options. The most popular types lifts you will find on this site include both jacks and lift tables from the following manufacturers. Please note that MotorcycleLiftsForSale.com is not directly involved in the sale of any piece of equipment listed for sale on this site. Although you are free to comment on any post, please be aware that most of these ads have been reposted and segmented for easy access. It is unlikely that the seller will ever see any comment that you leave. If you have a question for the seller or would like to purchase please use the contact info provided to reach the seller directly. If the contact information is out of date or incorrect please see below for instructions. Our goal is not only to display current lifts for sale but also to act as a living database for both potential buyers and sellers. The idea is to provide a rolling tally of what various types of lifts have been listed for in various conditions and in different regions. The ultimate mission is that this site will be a historical resource and provide an ongoing fair market value calculator for motorcycle lifts for sale on Craigslist. If you would like to report an ad as SOLD or if you are a seller and would like your personal info removed. Please send us a message on our Contact page. MotorcycleLiftsForSale.com is not in any way affiliated with Craigslist or the various brands listed on this site. Trademarks and brands are used in conjunction with the Fair Use clause of US Copyright Law.